As we made our way through the Western parts of Vermont chasing the Fall colors, we also stopped in fabric shops identified in Sandy’s special directory of such stores as a potential stop-and-shop. Her interest in sewing and quilting has grown quite a bit; as fabric and other supplies are abundant “back East”, such stops were not only a welcome chance to stretch the legs, but very interesting, as the scenery was fantastic and the towns gorgeous. 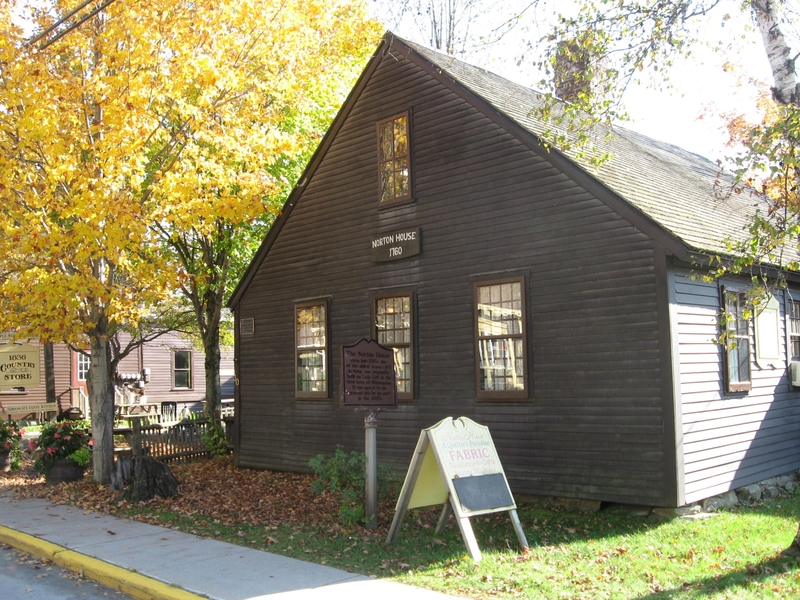 One of the fabric stores marked for “a quick stop” in her book was The Norton House, in Wilmington, VT, on Route 9. Built in the late 1700s, it was moved to its present location by ox cart in the 1830s. The Norton House is now home to A Quilters Paradise, a veritable candy store for sewing and quilting enthusiasts. I requested and obtained permission to photograph selected areas of the interior of the building, for it shows items of structural interest, and a collection of old hand planes in a display case. These planes are intriguing at best, as some may have been used in the construction of the House, or of some of the contents – it is not clear why they were in the house. It is difficult to convey the beauty of some of the less-traveled areas of our gorgeous country. Make plans to drive around this time of year; I recommend a side trip, even around your neighborhood. You will love it! I am glad you are enjoying my blog articles. I will take the Kerouac part as a compliment, as I know he was the King of The Beats ( http://timpanogos.wordpress.com/2007/06/06/typewriter-of-the-moment-jack-kerouac/ ). If so, my only regret is that I did not write this entry on a single scroll of paper! Another great Kerouac moment for you. I can’t help but hear Adam Cherubini in my head when I look at that plane display case, “we need to rescue all those old planes from people who want to nail them to a wall in an Applebees”. At least those look well cared for. Thanks for sharing.